Unemployment rate for both euro area (EA19) and EU 28 nudged down marginally from January to February of this year, according to data published by Eurostat, the statistical institute of the Europe Union. This is the lowest rate recorded in both areas since December 2008. 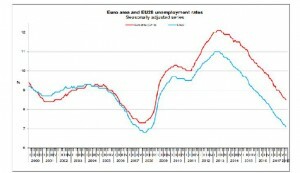 The euro area (EA19) unemployment rate was 8.5% in February 2018, down from 8.6% in January 2018; while within the EU 28 region unemployment rate was 7.1% in February 2018, down from 7.2% in January 2018. For the trailing twelve months, unemployment fell from 9.5% within euro area (EA19) to 8.5%, and from 8% to 7.1% for EU28. Eurostat estimates that 17.632 million men and women in the EU28, and 13.916 million in the euro area, were unemployed in February 2018. Compared with January 2018, the number of persons unemployed decreased by 201 000 in the EU28 and by 141 000 in the euro area. Compared with February 2017, unemployment fell by 1.968 million in the EU28 and by 1.436 million in the euro area. Among member states, unemployment rate varies tremendously with the lowest rate recorded in the Czech Republic (2.4%), Germany and Malta (both 3.5%) as well as Hungary (3.7% in January 2018). Greece and Spain recorded the highest unemployment rate of 20.8% and Spain 16.1% respectively. Estonia was the only state to record an increase in unemployment for the calendar year 2017. The largest decreases were registered in Cyprus (from 12.6% to 9.6%), Greece (from 23.4% to 20.8% between December 2016 and December 2017) and Croatia (from 12.0% to 9.6%). Among the Member States, low unemployment rates were recorded in Czech Republic (2.4%), Germany and Malta (both 3.5%) as well as Hungary (3.7% in January 2018) for February. The Member States which recorded the highest unemployment rates were Greece (20.8% in December 2017) and Spain (16.1%). Youth unemployment in February amounted to 3.589 million young persons (under 25) in the EU28, of whom 2.520 million were in the euro area. Linked with February 2017, youth unemployment declined 314 000 in the EU28 and by 213 000 in the euro area. The youth unemployment rate in February 2018 was 15.9% in the EU28 and 17.7% in the euro area, compared with 17.3% and 19.4% respectively in February 2017. In February 2018, the lowest rates were observed in Germany (6.2%), the Netherlands (7.2%) and the Czech Republic (7.5%), while the highest were recorded in Greece (45.0% in December 2017), Spain (35.5%) and Italy (32.8%).